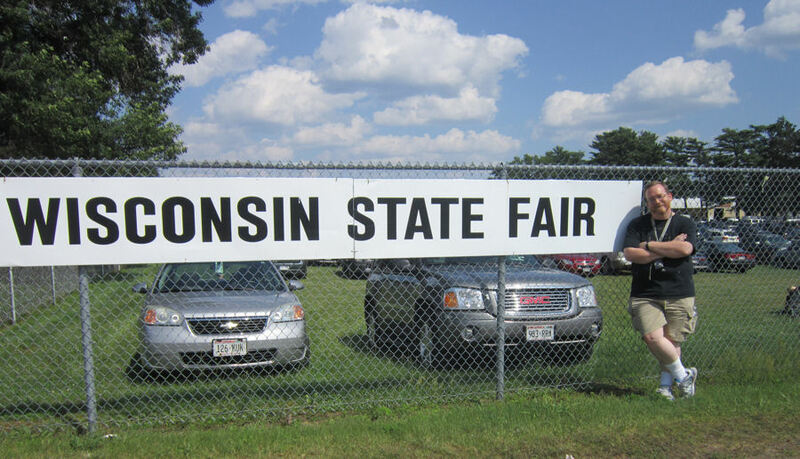 2014 Road Trip Photos #7: Another State, Another State Fair « Midlife Crisis Crossover! Your ideal Wisconsin post-lunch dessert: fried cookie dough! Each ball of batter-fried gooeyness contains a different flavor of cookie dough: sugar, peanut butter, chocolate chip, double chocolate chip, and white chocolate macadamia. Longtime MCC readers know my wife and I are loyal fans of the Indiana State Fair. Despite all the road trips we’ve done over the past fifteen years, we’ve never tried anyone else’s state fair. 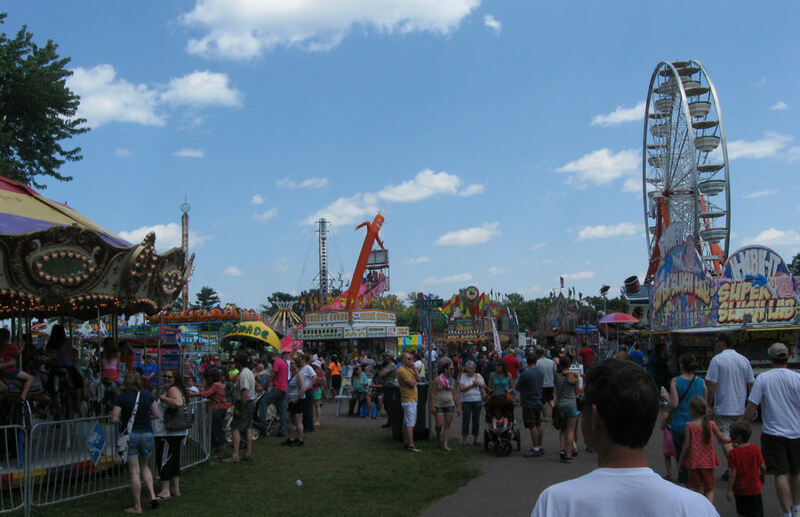 The idea has occurred to us more than once, but most state fairs are held later in the year than our vacation week. It’s not our fault that everyone else’s timing is wrong. This year we were shocked to discover a state fair held in July and in one of the states we were already planning to visit: the Northern Wisconsin State Fair, held each year in Chippewa Falls for the benefit of upstate residents who can’t work out travel arrangements to the adjectiveless Wisconsin State Fair outside Milwaukee, down in the southeast corner of the state. Once we confirmed it would exist during the right time frame and not far off our route, we had to squeeze it into our Day Two schedule. Familiar sights and smells to many of you carnival fans, I’m sure. We realized the Northern Wisconsin State Fair wouldn’t be a radical change of pace from our own State Fair. It was the principle of the thing. What if they had different, Wisconsinian options? 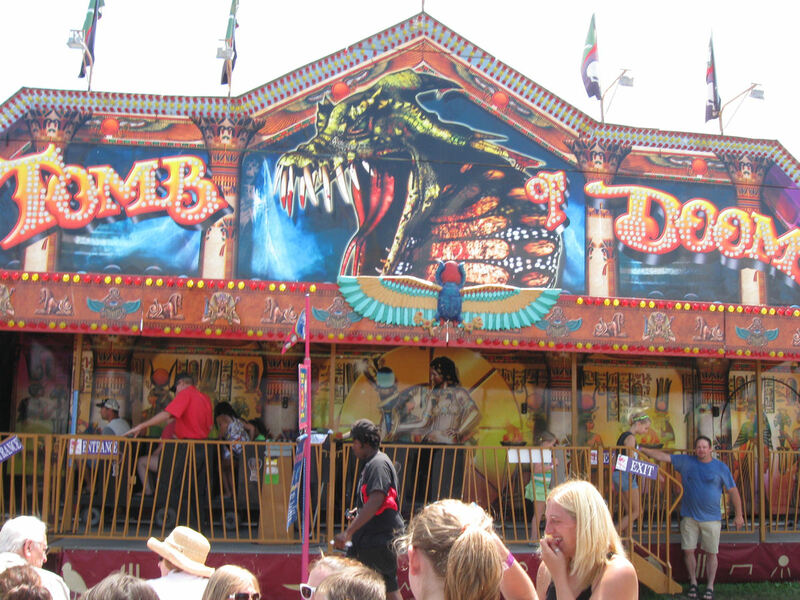 What if they had unique fairground attractions to call their own? What if it turned out really weird? Or…what if it was duller than American cheese? 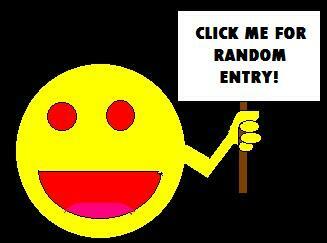 We accepted the risk of abject mundanity. Regardless, we would need lunch that day anyway, so we planned our departure time from Madison to ensure arrival at the fair in time for lunch, give or take an hour or three because of heinous traffic. We found a couple of new food options. Nothing groundbreaking, but nothing we’d seen back home, either. 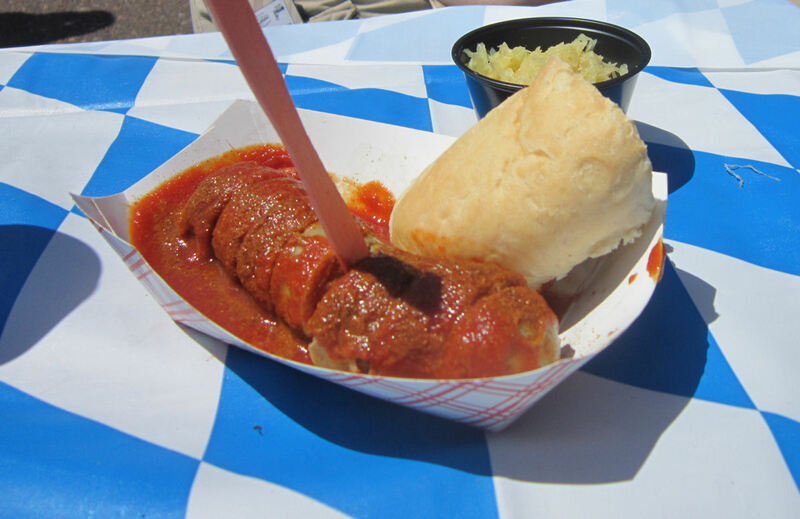 My lunch was a delicacy labeled “currywurst”, sold by a traveling vendor called ‘ZGerman Sausage Hut. German meat stylings, spicy sauce. I thought it was an India-Germany hybrid at first. Probably not. Up there in Photo #1 is me and my dessert, one of several insta-diabetic confections available on the premises from a most sugar-driven concession stand. Click the photo to enlarge and window-shop to your stomach’s content. Over a dozen fried-snack options to choose from. 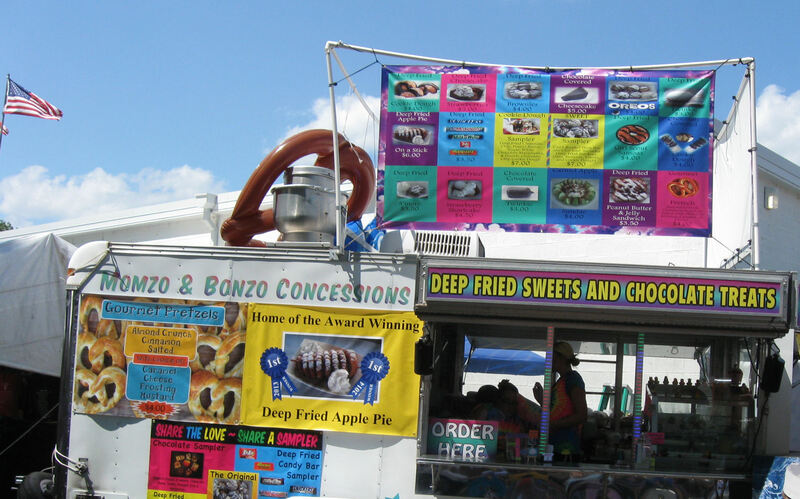 If you prefer healthier choices, I believe there was another booth selling batter-fried veggies. 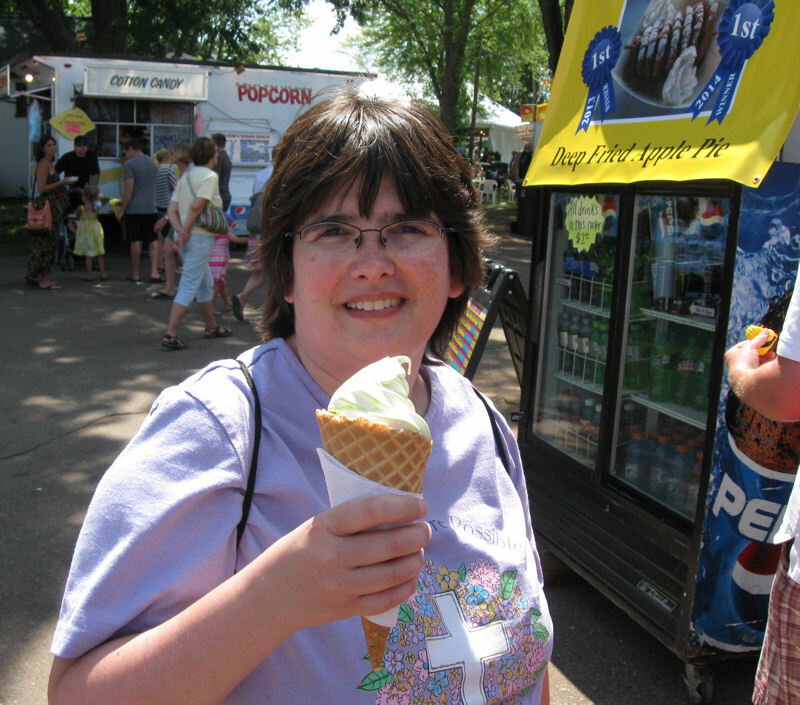 My wife was proud of her simple, humble Green Apple Swirl ice cream cone from some other benign, modest entrepreneur. This probably made nary a dent in her cholesterol level, compared to my death-dough platter. 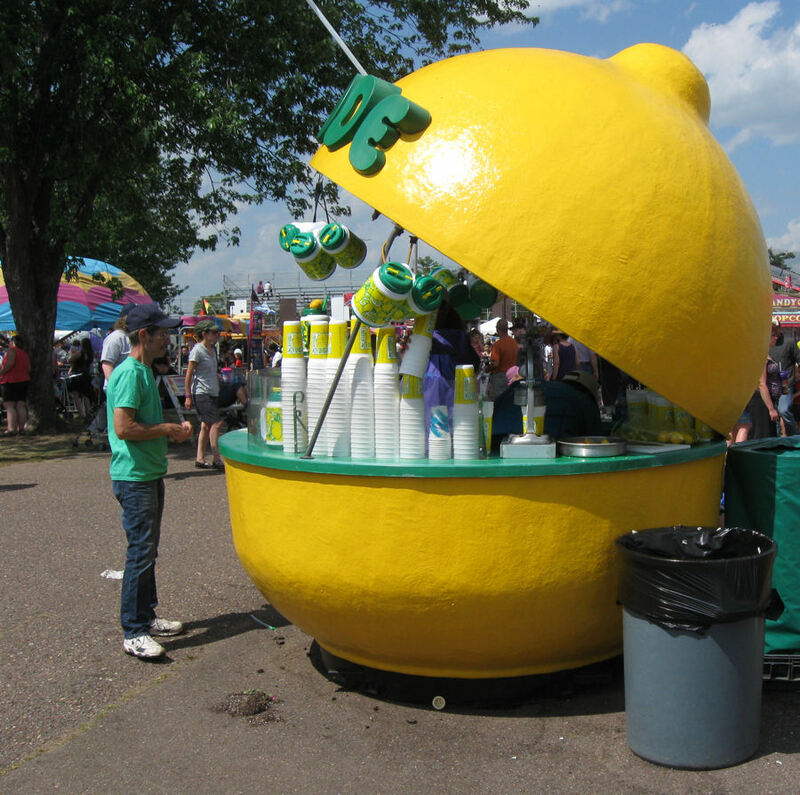 Most creative food-stand design: lemonade a la Pac Man. 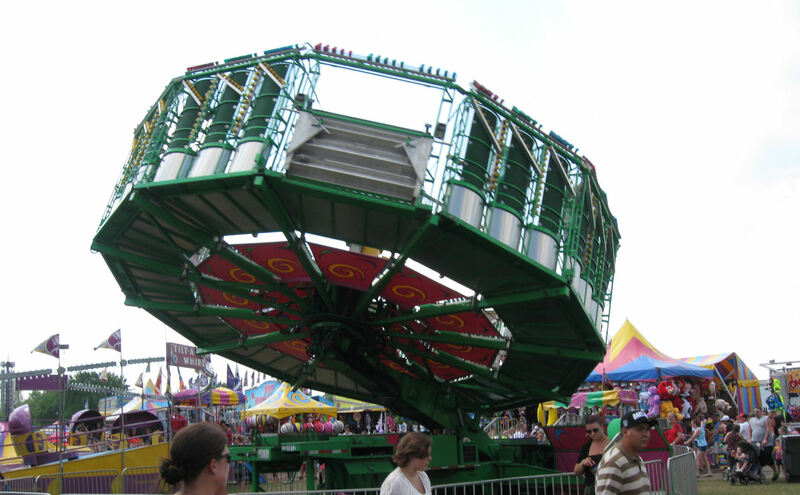 Food isn’t our only reason for attending fairs, but I must admit we’ve both lost interest in amusement park rides. We haven’t been on any rides since my son reached the age of too-coolness, and after one last Kings Island visit a couple years ago. (I meant to share photos from that here on MCC, especially since there were special guests involved. Someone please remind me to come back around to that in the future.) For us, most rides nowadays sicken or injure us. The technology and paint jobs may be improving, and maybe even the safety standards too, but our endurance and motion-sickness issues are assuredly not. UGH. How about we keep our feet on the ground and watch you go reach for the stars. Not all rides would have us reaching for my old friend Dramamine, but many of the calmer, less gravitationally intensive constructs don’t do much for us. If you’ve seen the three or four different kinds of fun houses out there on the carny tour circuit, you’ve seen ’em all. And neither of us feels compelled to spend extra money on ride tickets just so we can say that we rode anything. There’s no “Fair Card” that we’re worried about someone revoking from us for failing to be model midway customers. I don’t know this harmonzing quartet, but I’m sure they’re very nice and so we made a point of keeping our distance so we wouldn’t be crushed by their stampeding groupies after the show. 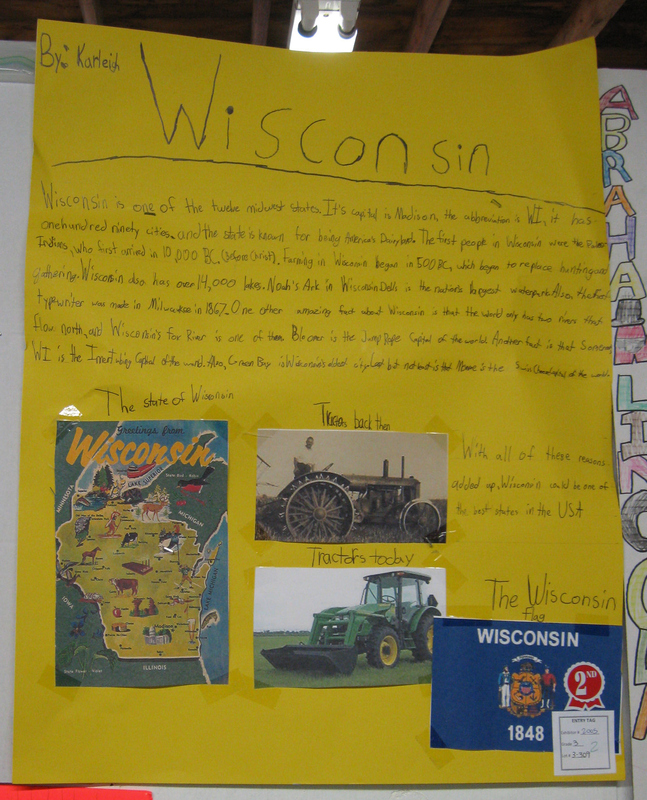 For us the strangest part of our visit was their 4-H exhibit building, its contents beaming with youthful Wisconsin pride. As visitors from a faraway land with our own sense of what statehood looks like to us, we learned a lot reading viewpoints from dedicated youngsters who love where they live and will cheerfully teach you all about it. I’m pretty sure this poster told us everything we need to know about what Wisconsin is, where it came from, and why it should matter to You, the Viewers at Home. Jimmy Wales wakes up every night in tears, wishing the Wikipedia entry for Wisconsin was half as authoritative as this document. Text, graphic design, and original font © 2014 Karleigh Doe, Inc. All rights reserved. To be continued. Next time: State Fair animals! Everything you ever wanted to know about the great dairy state but we’re afraid to ask. Glad you lived to tell the tale of the death dough. My most favorite state fair of all time is New York’s. Dinosaur BBQ and the BEST butter sculptures. Plus Native American exhibits and demonstrations of ceremonial dance & dress. The Midway lit up like a Christmas tree on steroids and Red Bull was so much fun. That sounds spectacular, and I’m sure the name “Dinosaur BBQ” alone speaks volumes! 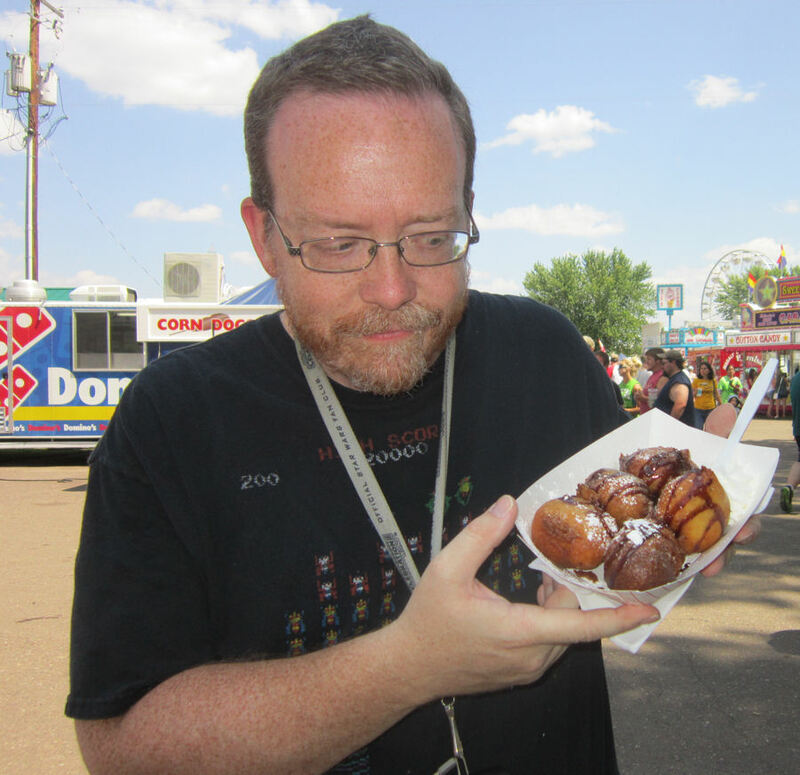 With Wisconsin’s State Fair I think the only other unusual food item we didn’t try was bacon/cheese corn dogs. If only we’d left any room, or had time to walk off our lunch and then stay for supper. I love fairs, even if my waistline doesn’t. I remember Mr. Mouth! My friends had that game. You’re totally right — the lemonade stand is a dead ringer for that. Just needs a pair of googly eyes and some giant chips to toss inside it. The employees might not like us throwing things at them, though.